Dr. Minette Riordan is a speaker, coach, author, artist and serial entrepreneur who’s passion is connection. Minette’s passion for connecting people to each self and each other is deeply rooted in her belief that it is our connection to spirit, to self and to others that is the foundation of true happiness. Over the years, Minette has found many unique ways of helping people to create both inner connection to their higher self and powerful connections to others around them. She is passionate about helping people remember how to be creative. Through her work as an educator, coach, writer and speaker, she has educated thousands of people, helping them to clarify their vision and bring that vision to fruition in ways that are meaningful, joyful and profitable. She and her family recently moved from Texas to Santa Barbara. Welcome to Santa Barbara, Minette! AWC: Describe your business. What you do and why do it? Minette: I am in the process of selling the parenting magazine I published for over 10 years in Texas and launching a new business. It’s exciting and challenging to be new in business again and in a new community. I am an author, speaker and lifestyle coach who loves to help women define vibrant visions for their lives and create an action plan to take them from vision to reality. Dreams are great, but they need action behind them to make them come true. There is nothing more rewarding than helping women reconnect to their inner well of creative expression, redefine their dreams and make those dreams come true, whether they want to write a book, start a new business or have a happier marriage. AWC: When did you start your business? MR: I am in the process of launching two new businesses. The first is based on my speaking, writing and coaching and is my personal brand featured at minetteriordan.com. I have a variety of group coaching programs for women as well as a membership group called the Creative Expression Circle. The second business is the HeartWise® Coaching Institute, which I am building with my business partner and co-author Dr. Caron Goode. HWCI will be a global coaching institute, training individuals to become life coaches with a specialty in relationships, parenting, intuition or creative expression. This business is still in developmental phase. AWC: What do you do differently than anyone else? MR: Good question and sometimes a hard one to answer for myself. Here’s what others have told me: that I have the ability to get quickly to the heart of an issue, I see people for who they are and am able to meet them where ever they are in a spirit of non-judgment and acceptance. I have a gift for asking the right questions and seeing the truth. This ability allows me to help people quickly get resolution on their challenges and make clear, heart-centered decisions on what to do next. AWC: What is your business philosophy? MR: Focus is freedom! What we focus on grows. It takes focus and commitment to make dreams come true. AEC: Why did you join American Women in Communication? MR: Because I am brand new to the Santa Barbara area and am looking to meet like-minded women who love communication as much as I do. AWC: Do you have any upcoming events or specials or anything else chapter members should know about? 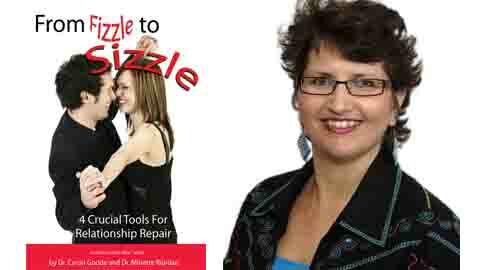 MR: My book From Fizzle to Sizzle: Four Crucial Tools for Relationship Repair is in soft launch mode and is available on Amazon.com. I have launched a new Meetup: The Santa Barbara Creative Expression Circle. AWC: What made you and your family decide to move to Santa Barbara? MR: We were ready for a lifestyle change. My husband and I met in the Bay area close to 20 years ago and knew we wanted to return to the west coast. My brother and his family are here in Santa Barbara, so that helped bring us here. Our criteria were beach and family and our options were Santa Barbara or Vancouver. SB won! We love being outside so much more than we were in Texas and we also love the small town feel of Goleta. AWC: How can members and friends of AWC-SB help? MR: I am looking for speaking opportunities locally and also looking for people to review my book on Amazon.com. On a more fun note, come visit one of my Creative Expression Circles for some creative playtime. AWC: Phone, text or email? How do you communicate these days and can you comment on each? MR: I rely mostly on email communication and am generally quick to respond. I also love texting for the quick response. I don’t generally answer the phone, unless I know who is calling and have time to chat. My conversations tend to be lengthy, because I love listening to people’s stories. You didn’t mention Skype, but I enjoy Skype calls and chats, too. AWC: How do you get the word out about your business or projects? MR: Most of my current marketing endeavors are virtual through social media and internet marketing strategies. In Texas, I was a huge networker and ran several groups of my own. I am looking to rebuild some of that locally. AWC: What are the unexpected challenges and joys of starting up in a new community? MR: The unexpected joy of Santa Barbara has been our membership at the Unitarian Society of Santa Barbara. Being a native Texan, hospitality is my middle name. I have felt very welcomed by this community and very at home. Unexpected challenges? Grocery shopping! I am a picky shopper and a Whole Foods junkie. Finding the best spots, best prices and most convenient stores has been an adventure. AWC: What has your experience been like to date in SB? Any surprises? MR: Our experience so far has been amazing. The best part of our daily life is our walks around our neighborhood or at Haskell’s beach. I cannot believe everything blooms continuously. I feel grateful to live in paradise every time I step out the door, even if it’s into my backyard. AWC: Anything else we should know about your business and/or you? MR: I love to work, but when I am not working, I love gourmet food, great wine, reading poetry and long walks on the beach with my husband. This entry was posted in Featured Members on November 16, 2012 by Lisa.